Vanilla bug in weapon paperdoll animations? 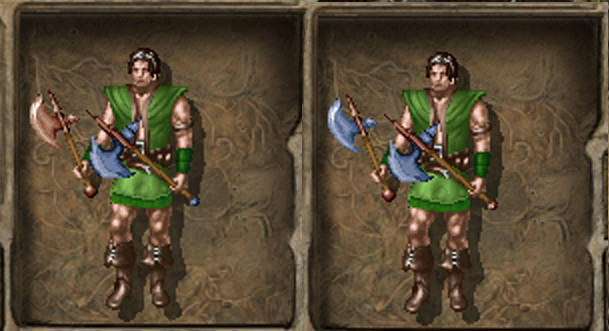 I have studied on how BG2 handles application of colour to the weapon animations within paperdoll, and noticed something weird. I have assigned 3 different colours for locations 16, 20 & 21 of my axe under opcode 7 for test purposes and went on to check it in game. First thing I saw was that item equipped to the main hand had only 2 colours applied, ones set for locations 16 & 20. Much to my surprise when equipped to the off hand it got back its 3 colours including the one assigned to location 21. Here's an illustration: 16 is green, 20 is yellow and 21 is red. First I thought that I erred somewhere because I'm totally new to graphics of the game, but eventually I found out that it's actually weapon animations template of the vanilla BG2 are broken. 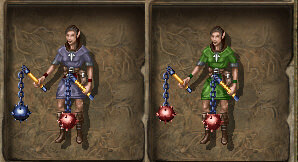 While some animations (sword, halberd, dagger and so on) have all 3 locations correctly colour-coded in, some (main hand axe, main hand flail and main hand mace) are bugged in that they all have location 21 colour coded as location 16. The reason I'm sure this is bug, apart from it's visual obviousness, is that off-hand animations of the same weapon colour codes all 3 locations correctly. Admittedly, there's only a handful vanilla item suffering from that bug because most of vanilla axes, maces and flails are having same colours for locations 16 and 21 lazily assigned to them, but vanilla ax1h02, ax1h03, ax1h07 and ax1h14 are all its victims, not to mention it harms modding. - is that a real issue or I missed something and see bug where there's none? - if yes, is it fixpack worthy? - what is the difference between quadruples of files like wphaxinv.bam, wplaxinv.bam, wpmaxinv.bam, wpsaxinv.bam, are they all used in some cases by the game or some are redundant? Is this in the vanilla BG2:TOB ? Or in the ... EE, asking only because there could be difference. Or not. So it's only the paperdoll, and the animations feature the 3rd color. Then it can be fixed. I would be a bit surprised if it weren't already fixed by the 1pp mod. But you might want to try it and find out. - checking 1PP was the first thing I did. Sadly I found no mention of wphaxinv in its tp2 or files, neither its extensive readme mentions such a feature, nor does there any change appears in my install of BWS with 1PP included. I would expect the difference be the user race ... there's very small difference between the last three you mentioned, and I would suppose it comes from where the specific race would place the weapon. For me all 4 looks absolutely the same (from vanilla PoV). How many paperdoll heights do we have anyway, 3 (shortlings, elves and humans), or 4 with halforcs? I never played with halforc so I don't know if it's taller than human. If 4, there might be a connection: bam files holds the data on where its centre is located, so may be it's how they got adjusted to different heights. Sadly I can't find any tool capable to display where the centre of the bam is, so this is but a theory so far. UPD: all 4 bams have the same centre (-4/-37 for the main frame), so this theory wasn't confirmed. 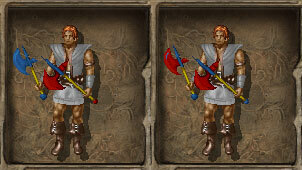 UPD2: Thanks to Erephine, these quadruplets of files have been explained: "Theres three sizes of species in Baldurs Gate. S stands for small, M for medium and L for large. 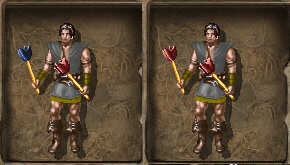 BG2 also has a fourth size called N, although one of BG2's sizes is redundant and not used at all by the game." checking 1PP was the first thing I did. Sadly I found no mention of wphaxinv in its tp2 or files, neither its extensive readme mentions such a feature, nor does there any change appears in my install of BWS with 1PP included. Further study proved this wrong so I'm marking this as such to not to mislead anyone. This is really well spotted. I love it bugs that have been sitting under thousands of player and modder's noses for years. On the upside, it looks like the fix would be to recolor about a dozen, small paperdoll BAMs. I am attaching 2 archives. "Main hand axe" is a recolour of vanilla axe paperdoll so that it now use all 3 colours as it was supposed to and as offhand axe correctly does. There's only a few vanilla axes that would benefit from that change, namely Battle Axe +1, Bala's Axe, K'logarath and both incarnations of Axe of Unyielding, but still this is how it should be and what modders might expect/benefit when coding 3 colours to their axes. "Off hand axe" is twofold: firstly it is a recolour of vanilla axe paperdoll so that it now use shaft colour for that little ball at the end of the shaft below handle instead of blade colour which was inconsistent with the main hand axe. Secondly H size paperdoll (used by male halflings, male gnomes and female gnomes) was lacking that little ball for good, now it is fixed. Here's an example of Battle Axe +1: vanilla on the left, attached files on the right. Yellow is the grip color, blue for weapon major, and red as the weapon minor. All vanilla maces use the same colour for 16 and 21 as well. However the mace issue is not so obvious: vanilla mace paperdoll composed of only 2 colours: 16 + 20 for one hand and 21 + 20 for another. Technically it allows modder to double desired weapon head colour in both 16 and 21 to ensure that his mace will look the same in both hands. However this is really sloppy hackjob and should be fixed if only for the sake of adding some consistency and logic into weapon paperdolls. Damn, clearly I should have waited a day. Thanks again Creepin, I'll make sure this gets into the next release. CamDawg, one more detail for the next release: I've improved a main hand axe paperdoll to make it exact copy of the vanilla (but in correct colour of course) My previous attempt was a little brighter than it should. Off hand axe is fine though and doesn't require correction. It looks like 47-Pure Dark Red and 58-Dark Blue (and maybe 80-Saturated Bronze). Holy crap, that's a good eye. It's 47, 50, and 58. My test items are attached. So, these files have to be put before or after the install of BG2 Fixpack 11.3 ? After--drop 'em in the override.